In summer, a cozy seating area and a barbecue are available in the garden. In front of the house you can park comfortably. There is also the possibility to store bicycles. Equipment: Living room with sofa bed, some with underfloor heating, dining table, cable TV, stereo system with CD player, well equipped kitchen, bedroom with double bed, bathroom with shower / WC. 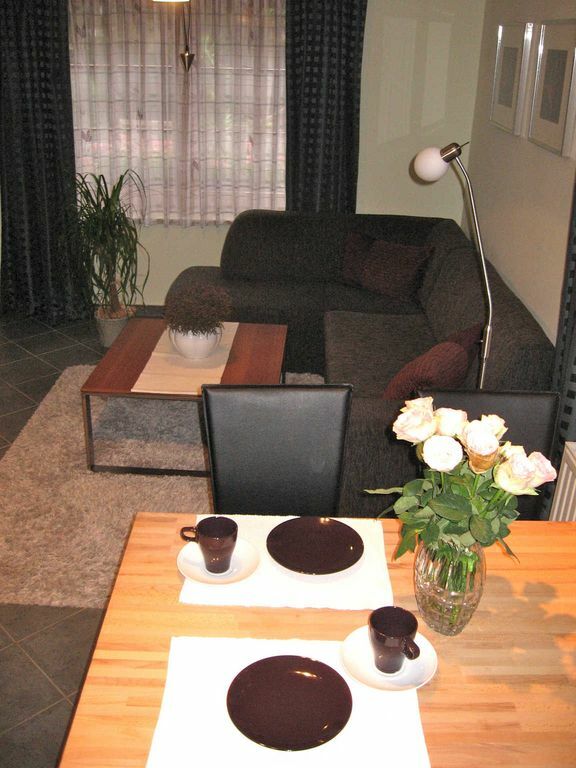 Our modern and comfortably furnished apartment is located directly on the edge of the forest below the Wernigerode castle, but still very central. The castle can be reached in about 5 minutes and the famous city hall in the center of the city in about 10 minutes. In the apartment you can enjoy absolute peace. In summer, a cozy seating area and a barbecue are available in the garden. In front of the house you can park comfortably. There is also the possibility to store bicycles. Equipment: Living room with sofa bed, some with underfloor heating, dining table, cable TV, stereo system with CD player, well equipped kitchen, bedroom with double bed, bathroom with shower / WC. Die Innenstadt ist vom Objekt aus recht gut erreichbar ohne jedes mal das Auto nutzen zu müssen.